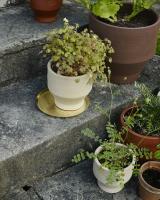 The Edge brass plate complements the terracotta pots from the Edge series available in both indoor and outdoor versions. With the Edge plate, the outdoor pots can be moved inside in the heat when needed in a beautiful contrast between the shiny brass and raw terracotta. 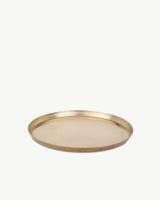 Edge plate also functions as a versatile tray, reflecting all shapes and colours placed on its surface in new and playful expressions.